It is essential to calculate hourly wage from salary or use an hourly wage calculator to keep track of overtime. The ratio of work hours to pay changes when you are spending more hours at work. Keeping track of that ratio can be complicated. Using an hourly salary calculator or an hourly wage calculator to calculate hourly wage from salary makes watching that ratio simple. The best part is this tool is free right here! Maintaining an hourly salary calculator is important. Working more than 40 hours a week is typical for salaried positions. What if the workweek is more than 40 hours? The hourly salary calculator comes into play. When you use this Excel hourly salary calculator worksheet, it becomes a straightforward task to determine. Using this free tool it is easy to see how hourly pay rates drop when hours increase. Plugging in your numbers to this hourly salary calculator could not be easier. Stay on top of hours to income ratio when you use this Excel spreadsheet to calculate hourly wage from salary. Keeping tabs on overtime hours or figuring out the amount of overtime you will need to achieve a financial goal is a snap with this hourly wage calculator. 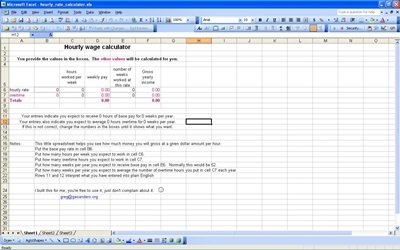 This Excel hourly wage calculator will help you in making those decisions on overtime. While you explore this free Excel hourly wage calculator, take a few moments to browse the other useful Excel tools and games offered. Whether you are looking for financial, family, or fun applications, you will find an easy to use Excel application to fit the bill. Regardless of whether you decided to take advantage of these other exciting Excel games and tools, you are welcome to take advantage of the free tool to calculate hourly wage from salary.